One of the reasons I’m proud to work at Yahoo! is that we have some very nice products that reach hundreds of millions of people worldwide. Another reason is that Yahoo! is behind the development of several advanced technologies and platforms, such as Hadoop. This is no coincidence, since sophisticated solutions are required to serve efficiently so many users and to handle effectively the huge quantities of data they consume and generate. I think that the most innovative concept of Cocktails is that it transforms the client device in an additional machine running in the cloud. Since the client and server sides execute the same language, all code that runs in the client side may also run in the server side. In other words, the functionality associated with the client may run on the server, and this may be changed dynamically, following a decision based on performance issues. This in practice blurs the boundaries between client and server machines, and transforms the client device in an integral part of the cloud. 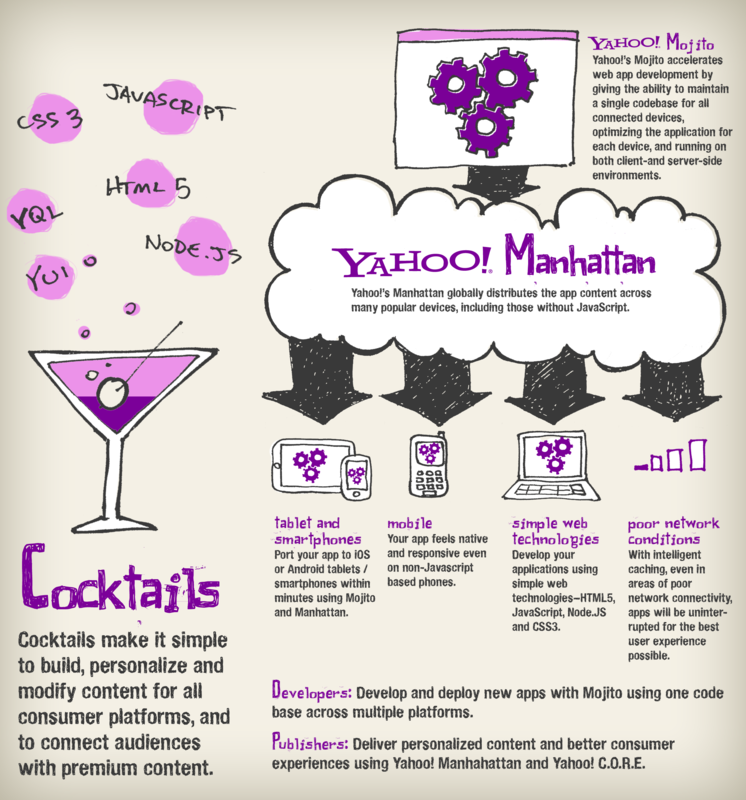 Cocktails is the technology behind one of Yahoo!’s most recent products: Livestand, a personalized magazine for tablets. In the future, Yahoo! plans to make the Mojito framework available as open source and the Manhattan platform accessible to the community of developers of Mojito applications. This entry was posted in Cloud Computing, Software Architecture, Web Development, Yahoo! and tagged Architecture, Cloud, Web, Yahoo!. Bookmark the permalink.